Presented at SJDM in Vancouver – Adrian R. Camilleri, Ph.D. I slowly made my way up the US west coast from San Diego, CA to Eugene, OR before catching a flight to complete the journey to Vancouver, Canada to attend the 38th Annual Conference of the Society for Judgment and Decision Making. Along the way I stopped at Huntington Beach, Los Angeles (highlight: Griffiths Observatory), Santa Barbara, Hearst Castle, Paso Robles (highlight: Dark Star Cellars), Monterey, Carmel, Santa Cruz, Half Moon Bay, Palo Alto, San Francisco (highlight: hike starting at Stinson Beach), Chico, and finally Eugene. Well over 20 hours of driving and more than 1,000 miles on the road! 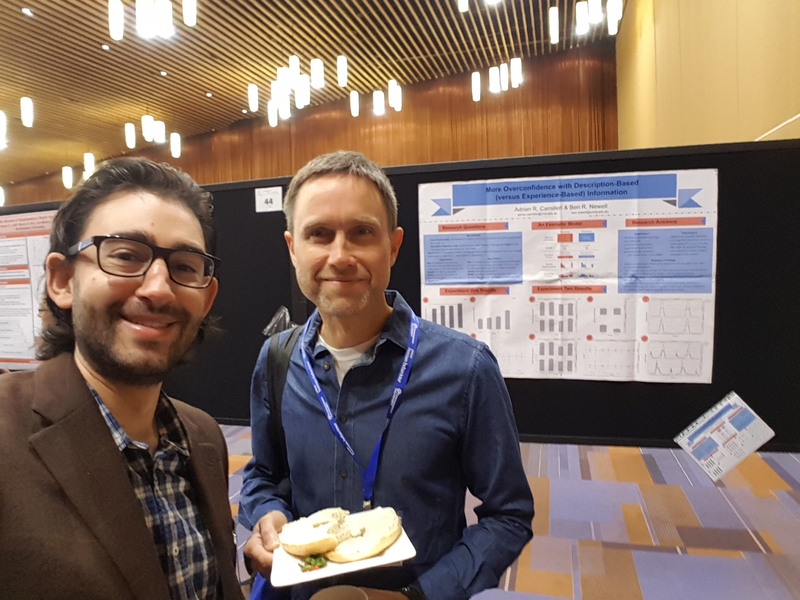 During the first poster session of the conference I presented a poster together with Ben Newell (pictured) titled, “Overconfidence in Description- and Experience-Based Choices”. I got some valuable feedback from visitors such as Elke Weber and David Budescu. Later that morning I gave a presentation titled, “Consumer Underestimation of Energy Use and Greenhouse Gas Emissions Associated with Food Camilleri”, which is joint work with Richard P. Larrick, Shajuti Hossain, andDalia Patino-Echeverri. It was very intimidating to see recent Nobel Prize winner Prof. Richard Thaler in the front row! I braved up, put on my “nudge” shirt, and asked him for a photo, which he graciously gave. Food is a major source of energy use and greenhouse gas (GHG) emissions yet its product and impacts are invisible to consumers. Study 1 confirmed that people underestimate the energy use and GHG emissions associated with food. Study 2 showed that a carbon label reduces the average carbon footprint of a hypothetical meal, particularly for those with pro-environmental attitudes. Study 3 showed that the effectiveness of the carbon label was mediated by a greater understanding of the carbon footprint of available food options. Diet change through carbon labels may be an effective strategy to help combat climate change. It was great to meet old friends and collaborators. One highlight was hearing the presidential address by Prof. Rick Larrick, which emphasised that thinking hard about a problem is not very useful if you do not have the right strategy, and that the literature on expertise was quite relevant to this. I also enjoyed a talk by Dan Feiler that showed that people overestimate chosen options. That seems obvious (the best insights usually do once someone has voices them) that but it comes with some interesting consequences.